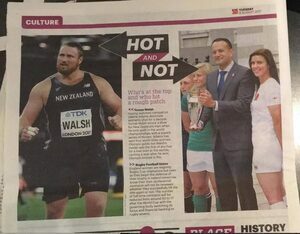 Dubai-based English language sports daily, 360 uses a Leo Varadkar image to stick the boot into women’s rugby. Posted in Misc and tagged Leo Varadkar, rugby, women's rugby world cup at 11:01 am on August 11, 2017 by Aaron McAllorum. Spotted during Ireland’s loss to France at the 3rd/4th place play-off in Paris at the IRB Women’s Rugby World Cup. Posted in Sports and tagged France, Ireland, women's rugby world cup at 5:25 pm on August 17, 2014 by Aaron McAllorum. Watch Coghlan’s army take on the USA in their opening game of the IRB Women’s Rugby World Cup LOIVE on TG4 from Paris at 3:50 pm today. Posted in Sports and tagged Ireland, Paris, USA, women's rugby world cup at 9:53 am on August 1, 2014 by Aaron McAllorum.